I peeked out the door before going to bed two nights ago to see if, for once, the weather forecast might actually be right. They said we were getting snow, a LOT of snow, but I've heard that before and then woke up to no snow, not even a flicker of a flake. Still light enough to be pretty, just resting on the branches. Notice a few things in this picture - the amount of snow on the table, on the bench under the tree, and again, the fence row. Woke up early this morning, and here's what we had! It's been snowing all morning and we are supposed to get up to 10 more inches before morning again. I tried to take a pic of the same view for comparison, but there's such a white-out out the back door that nothing shows up but a white square. So I took a picture of the other side. 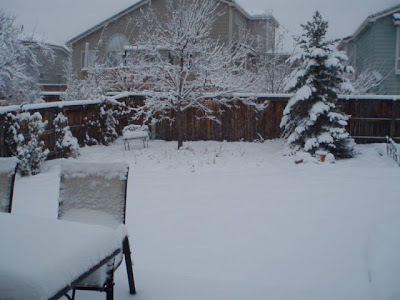 This is a current picture as of noon today in Denver. This is the same view as the very first picture. You can't even see our birdbath anymore. 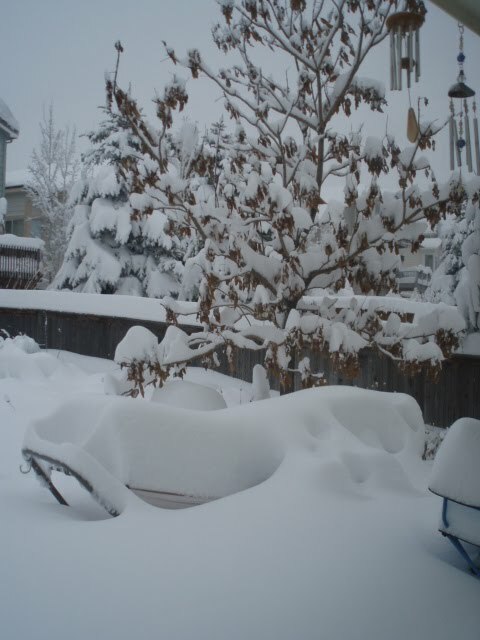 That's our hammock under all that snow! We didn't remember to bring it in before the weather hit. There's about 28" of snow as I type this, and it's still coming. A yummy, yummy, yummy mocha latte! Look at all that marshmallow creme. Hmmmm hmmmm hmmm. Try this recipe. You won't believe how good it really is. I use the Nestle hot cocoa with the bunny shaped marshmallows in it. I top it with marshmallow creme, and I use crunched toffee. Pour cocoa mix into a large mug. Add coffee and mix. 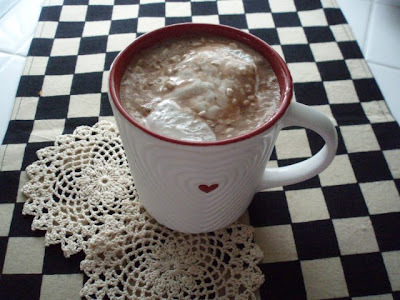 Microwave milk for 30 seconds, and then add to mug with cocoa mix and coffee. Wow....I can't believe all of that snow!!! I heard Denver was going to be hit with a big snow storm. 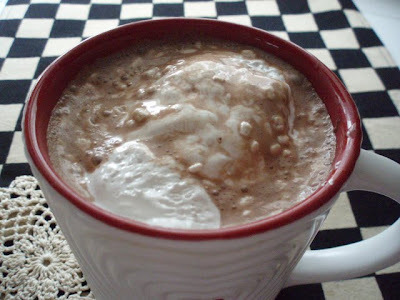 Thanks for the recipe for the easy mocha latte...I'm definitely going to try this. Wow, does the snow normally come so quickly at this time of year? Those pictures are amazing. That hot chocolate looks delicious-stay warm! Best wishes from sunny Australia, NM. Oh gosh, my husband's corporate offices are in Denver but we don't live there. Thank goodness! That's too much too soon for me. I will definitely be trying your mocha latte recipe. Your Mocha Latte looks wonderful in your "special" cup. How sweet of him to get it for you and even sweeter to make you a latte for your snowy day. 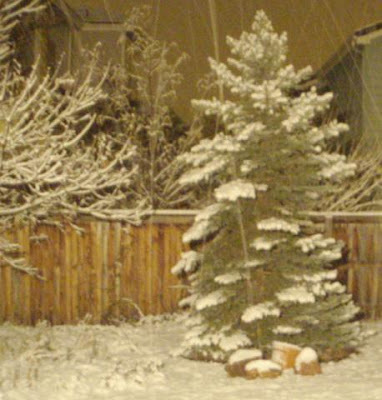 It's cooling now in Ca., but nothing like your snowfall. I would be cuddled up under a quilt that I am quilting on... but alas I'm getting ready for the Ventura Flea Market Sunday. That is a lot of snow. Stay warm. GORGEOUS photos and my is that a lot of snow! You reminded me of my days in NY...I have to say I love looking at the snow but I don't miss having to drive in it. Please tell your hubby that he is indeed sweet for buying you such a lovely mug!! Thanks for stopping by...hugs and love to you! I see you are a fellow Coloradoan! Actually I just moved to Co 2 years ago next month and am still trying to get acclimated!! I mean the minute it starts dipping in the 40's my little silky thermals on glued on!! All of that snow looks a little frightening because, you see, us California natives are gonna up and move to Colorado by next summer hopefully. We just hope we can survive the winters. My parents live in Littleton, our kids are in college, and so now is the first time in over 20 years that we can make a change. Colorado has won out. I won't show this picture to my husband...he just may change his mind! 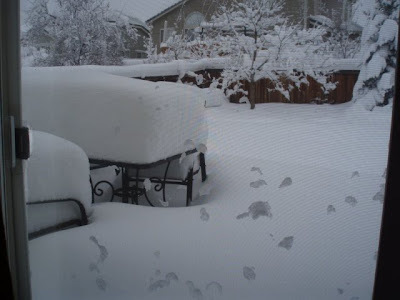 Linda, this is actually the most snow we've gotten in over 12 years........in October that is! Our normal heavy snow months are March and April, believe it or not. In the past 5 years we've had snow storms of over 40" 3 times in the month of March. We're gonna be moving back south as soon as we can, probably after the first of the year. I won't show you the really bad pictures where I had to use my 48" ruler for measuring! Traci, that's good to know!! I was sure I was the one client you made faces at behind your computer screen! You were great, and patient. Thank you everyone for always leaving such nice comments. That's great motivation to a new blogger's ego. I just found you through another link. And what a pretty blog you have! I'm so impressed. I'll be back to visit again. Your hubby is very sweet. I love the looks of that sweet cup he both bought for you, and made for you in it! 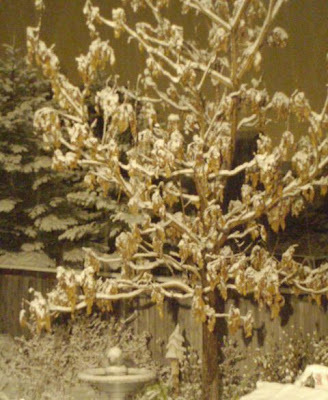 Love the snow pics!! I live up in the Fort and we only got about 16 inches but it's almost gone with the last couple of sunny days. It was pretty while it lasted! sewtakeahike, you live close to me?! That's it, I'm coming over and rummaging through all of your stash! Put tea in the kettle and wind up a stack of bobbins! Love your blog.